In the Suavecito pomade page, I mentioned that Suavecito also made a shaving cream that I was able to try out about a year ago. 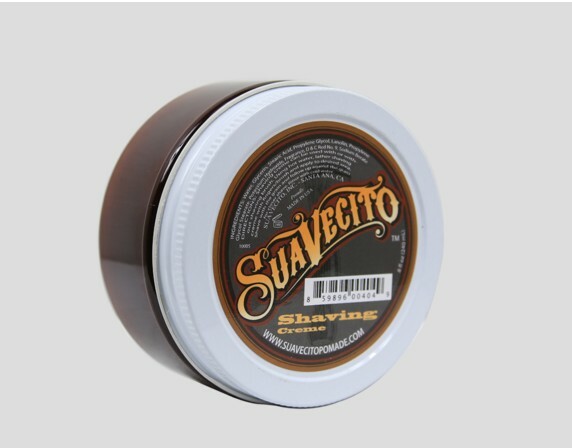 At the time, my hairdresser was carrying the whole Suavecito line and since I loved the pomade it was just a question of time before I tried the shaving cream. As you can see in the pictures, the cream comes in a nice glass jar with a metal lid. In my mind that’s how things should be. Something durable and old school. At the time, I did not have a shaving brush so I simply applied the cream by hand on my face. You must be warned here, this is not a shaving cream for everybody! It is seriously minty and totally intense! The intensity of the cream was good in the sense that my face was woken up and we can say the same for my beard. As far as cream goes, it was better than what I was using at the time. You could feel the buttery tickness and shear quality. The resulting shave was also just as perfect. 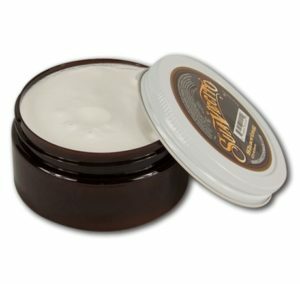 Thinking back on it, this is the cream that motivated me to start trying out more different shaving products. I did not actually finish the jar, as it was too intense for my daily shave. I ended up passing it along to a work friend. He was equally impressed by the overall quality of the product and was in agreement with the minty face wake-up call. If you have never tried what I will call a shaving “butter”, this is worth the experience. Just be forewarned that it also packs a punch.